Cooking an entire nine pound turkey is no easy feat, especially for the kitchen novice. It’s no wonder Butterball has a Turkey-Talk hotline for Thanksgiving emergencies and dire questions that need immediate answers. While not everyone can be a turkey expert, it is possible to have a stress-free holiday by sketching out a general prep and cooking timeline. Follow our tips for the ultimate thanksgiving meal no matter how many people you’re having or what dishes you intend to serve. Whether you’re just having a quiet Thanksgiving at home with your immediate family, hosting a friendsgiving dinner party, or cooking for an entire branch of your extended family, the first step is knowing what you’re going to make. While formal invitations are unnecessary, even with friends, get in touch with each person about a month beforehand to find out if they have any dietary restrictions or specific requests. Turkey and/or ham are staples of a Thanksgiving feast, but there can be upwards of 10 or more side dishes to accompany your meat of choice. Compiling recipes ahead of time will allow you to see which dishes can be cooked ahead and which need to made the day of according to how much time they take. Now that you know which dishes you’re serving for Thanksgiving, you can create a shopping list. A few weeks beforehand, take a look at your recipes and write down everything you’re going to need in order to make each dish. Make sure you account for how many people are coming by sizing up the servings if necessary. This is a great time to pre-order a fresh turkey from a butcher. Frozen turkeys can wait a little longer, but definitely don’t wait longer than a week before Thanksgiving or you might have a hard time finding the right sized turkey for your party. 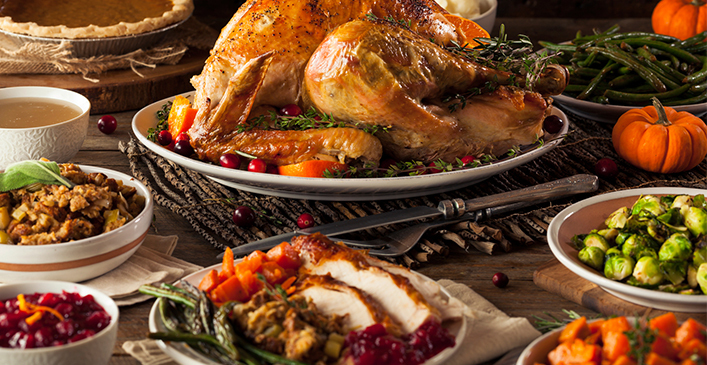 In general, turkey portions are about one to one and a half pounds per adult, and about half of that for children. Next up is shopping for ingredients. Non-perishable items should be purchased about a week ahead to save prep time in the kitchen. In general these include baking ingredients such as flour, sugar and canned goods. Kitchen tools such as a meat thermometer, extra baking pans or casserole dishes, and a turkey baster should also be purchased during this time. Perishable food such as vegetables and bread can be bought a day or two beforehand in order to maintain their freshness. Now is the time to purchase your turkey if you haven’t already done so. Thawing a turkey can be one of the most daunting and stressful parts of planning a Thanksgiving meal. If you don’t thaw it enough, it will take a longer time to cook, about three to four hours depending on the size. There’s also the matter of where to thaw it. The safest place is always in the refrigerator. Never leave a turkey on the counter to defrost; you’ll run the risk of food poisoning due to bacteria and an uneven thaw. Alternate thawing methods include placing the turkey under cold water or in the microwave if the bird is small enough. In a pinch, frozen turkey can go straight in the oven, which should be done first thing in the morning as it’ll need five or more hours to fully cook. Cooking side dishes the day before will allow you to focus on the turkey and putting the finishing touches on everything else. Most traditional Thanksgiving sides such as mashed potatoes, candied yams and green bean casserole are easy to make and keep well in the fridge. Dessert ingredients such as pie crusts should be made the day before if you’re not using a pre-made frozen crust. It’s a good idea to make your cranberry or other types of sauces and dips the day before too. Chop vegetables and cook toppings for side dishes as well, which will save time the day of. When Thanksgiving day finally rolls around, it’s time to put everything together. Preheat the oven and stick your turkey in there, allowing enough time for cooking and cooling depending on the weight. Bake your pies early on as well and add toppings to pre-made side dishes. Chill your drinks and set the table or delegate family members to do smaller tasks like these for you. Reheat your side dishes about a half hour before the meal after you’ve taken the turkey out of the oven. Be sure to transfer everything into nice serving dishes and arrange in an aesthetically pleasing manner. Your guests will likely want to take photos of your immaculate feast and share them on social media. Once everyone has sat down to dinner and you prepare to carve up your turkey, remember to relax and enjoy your meal. You earned it! Now it’s time to focus on spending time with family. The dishes can wait and leftovers can be divided up among your guests in disposable Tupperware containers.